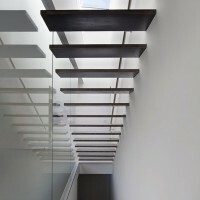 Splyce Design have completed the Findlay Residence located in North Vancouver, Canada. 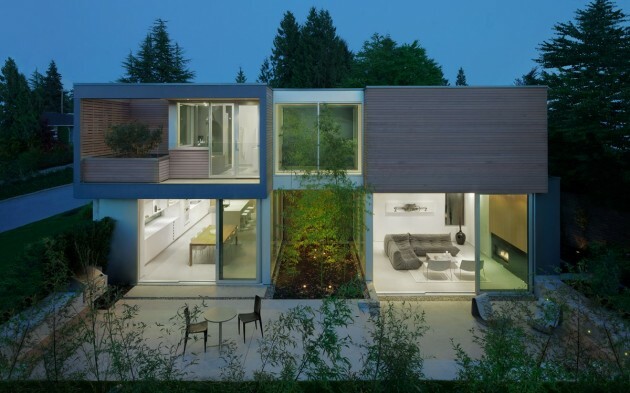 The Findlay Residence is located on a flat, irregular shaped site in North Vancouver. Designed for a young active family of four, the principal living spaces of the home are organized around a two storey exterior void within the main volume of the building. Planted with bamboo and glazed on either side, this cutout serves to create separation between spaces without fully disengaging them from one another. On the main floor, the bamboo garden subtly divides the kitchen/dining space from the living area- a dynamic that serves the family well with their busy and differing schedules. On the upper floor, the tall bamboo from below screens the master bedroom sleeping and change area from its adjoining bathroom. These two spaces are connected with a glazed bridge. Light and shadow animate the white walls by the passing sun as it enters through the large skylight above the central staircase. 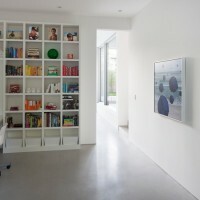 Windows and doors are calibrated to capture the natural light and views to the garden and mountains beyond. On the building’s west elevation, large sliding glass doors activate the adjacent patios allowing space to flow from inside to out, and all at once the space becomes pavilion-like with its ample porosity. 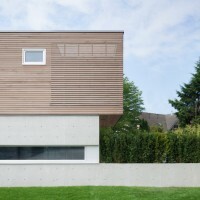 In contrast, the street elevation on the north reads more formally with its cedar and concrete walls stretching out horizontally across the site and into the landscape. Due to site constraints, there is no usable back yard, so the front serves as a playing field for the client’s two boys. A simple interior palette consisting of concrete floors, white lacquered and oak cabinets and white walls serve to strengthen the clarity and purity of the spaces and allows the vibrancy of the the natural environment and landscape features to pervade.